Ever since H.G. Wells wrote The Food of the Gods , scientists have been creating bigger spiders. Usually it’s in the pursuit of better nutrition, but every now and then it’s a straightforward attempt to weaponize arachnids. 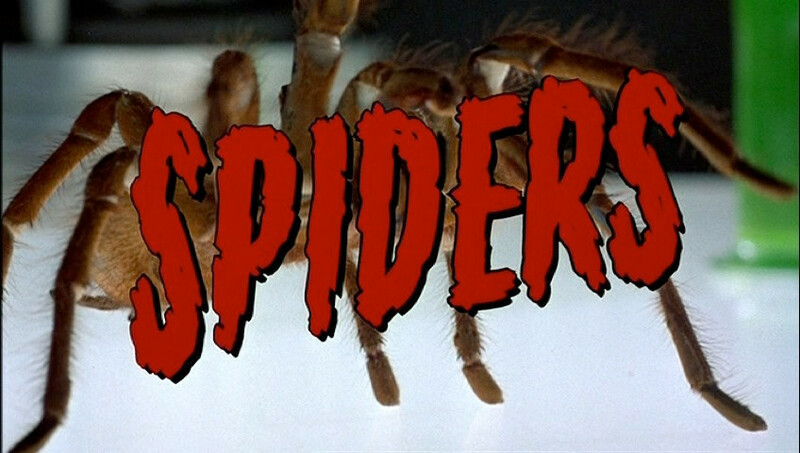 The film Spiders is the first entry in a series of movies based on this inadvisable weapons program. The story centers on conspiracy-minded reporter Marci Eyre (Lana Parrilla), who is suspicious of activities in the clandestine Area 21. She ignores an order to cover the Solaris space shuttle mission to go investigate the location. Of course, when things go wrong on the shuttle, it’s remote piloted to Area 21. Eyre is in for the scoop of a lifetime, if she can survive the experimental fallout. Marci reads a NASA photo-book that turns into a Time-Life collection of introductory fringe science. 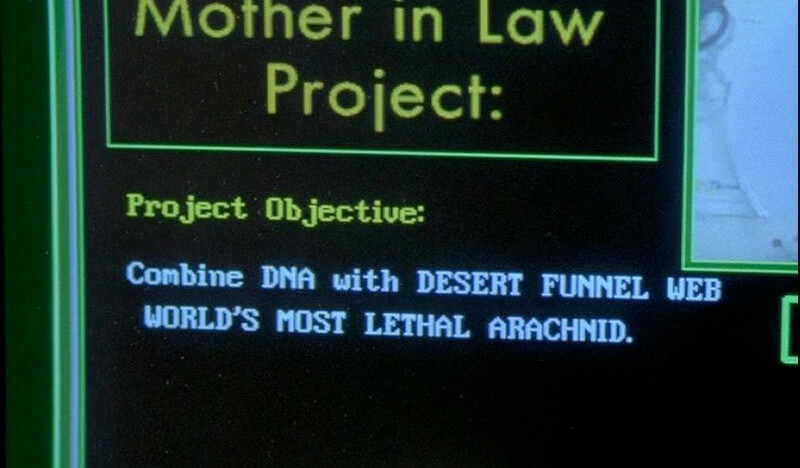 One of the projects being carried out on the shuttle mission involved the hybrid spider code-named Mother-In-Law. This was a hybrid of funnel web spider with alien DNA, because you want to handle an aggressive, venomous animal as much as possible. Mother-In-Law gets loose after a solar flare disrupts the shuttle, and it’s all fangs and regrets for the rest of the film. A lot of this takes place in the underground base at Area 21, and honestly those are the best parts of the movie. 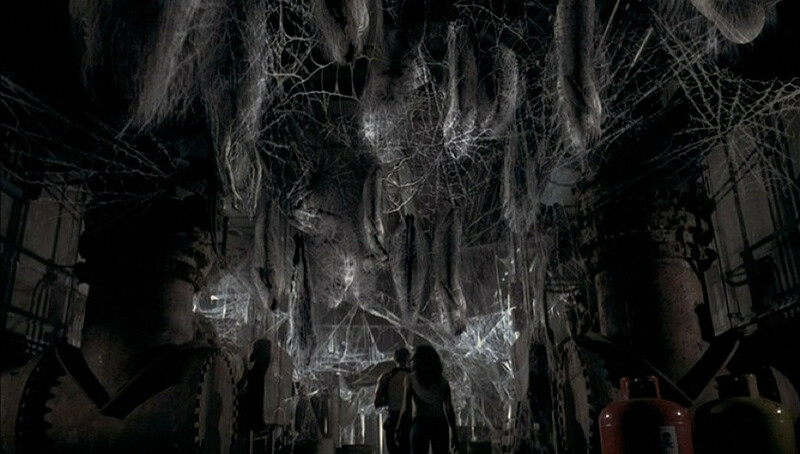 Agents simultaneously hunting spiders and Eyre’s group, narrow hallways, evidence of past coverups, a web in an elevator shaft — it’s pretty good stuff, and the spider puppets work rather well in the environment. As soon as one gets outside, it turns into a tedious countdown until it’s inevitable climb up a tall building. The first offspring emerges from one of the shuttle crew. The CGI compositing is less effective in the daylight, but with such a great set of puppets I didn’t mind so much. The big problem in the third act is that the script is out of ideas. The first sign the film has run off the rails is when a character beats the heroes to Eyre’s paper, despite carrying a spider the size of a poodle inside of his abdomen. Granting that it must’ve grown rapidly, it would have had to be consuming vital organs the whole time, which at the very least would be a nuisance. Yet he’s fine up until about 5 seconds before the thing bursts out of him like angry candy escaping a startled piñata. There are a few nice rampage shots after that, but it’s all stuff we’ve seen before. It’s a really good puppet. 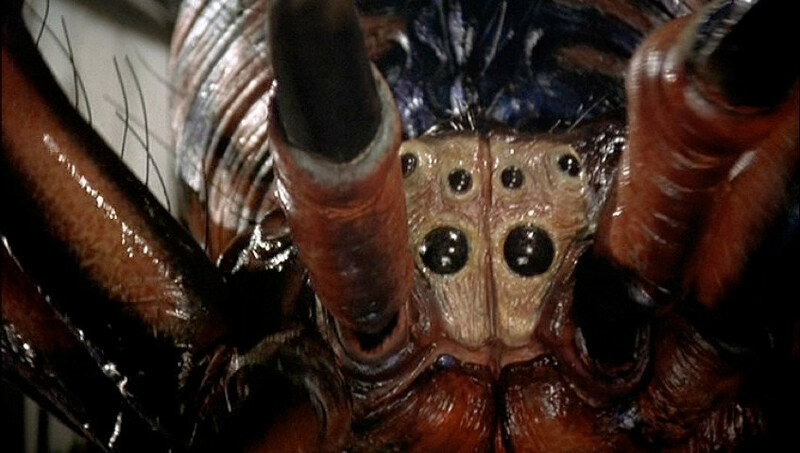 There’s at least one sequel — Spiders II: Breeding Gound , which came out the following year. From what I remember, it’s a similar premise but unconnected. Twelve years later, Spiders 3D came out with yet another take on the military genetically modifying spiders. It has many of the same producers, including creator Boaz Davidson, so what we have is a loose thematic trilogy. Not Howling franchise levels of complete reinvention each film; more like the Blind Dead series, which all had a similar mythology. You certainly don’t need to see them in any particular order, as they all stand on their own. I genuinely love this shot of the cocoons. This isn’t the sort of movie you tell your friends about. It’s got some nice effects work, and if you’ve seen the show Once Upon A Time it’s fun to see the Evil Queen being credulous to a fault. The thing is that it’s a deeply mediocre film — too good to laugh at and too bad to get into. It’s a SyFy movie you’re not completely sorry you watched.